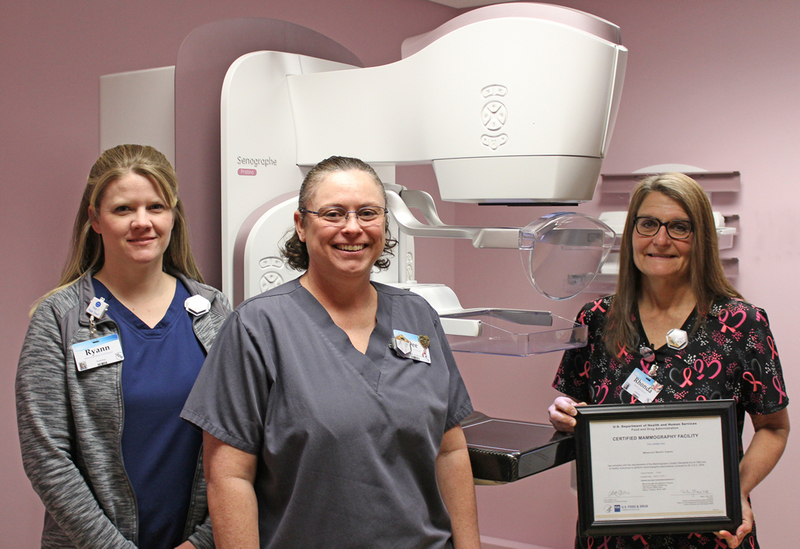 Memorial Hospital mammography technologists (from left) Ryann Woodall and Dee Parker stand alongside Radiology Department Manager Rhonda Schmid who is holding the certificate for the department’s recently received ACR accreditation. Memorial Hospital Mammography Services has been awarded a three-year term of accreditation by the American College of Radiology (ACR) and is in compliance with FDA Mammography Quality Standards. Memorial Hospital has complied with the requirements of the Mammography Quality Standards Act and is a certified mammography facility. The team, led by Radiology Department Manager Rhonda Schmid, submitted images, quality control procedures, adequacy of facility equipment, and credentials on all radiologists, mammography technologists, and medical physicists that were reviewed by an ACR committee. The Radiology and Imaging Department at Memorial Hospital, which completes around 1,100 mammograms per year, offers state-of-the-art technology with 3-D Mammography available to all patients in Abilene. ACR accreditation represents the highest level of image quality and patient safety which ensures quality care.